So to any of you who know me, either online as some twisted Internet pseudo-personality, or more unfortunately for you in real life, it probably won't blow your mind that I like Clerks. Now, if you don't know what Clerks is, A) Shame on you and B), the debut film of director Kevin Smith, shot famously on incredibly little money and detailing the mundane life of convenience store "Clerks" in Smith's native New Jersey. 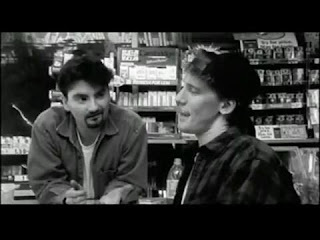 While I think out of the three of us, I am the one of which Clerks has continued to endear most, the Kevin Smith story does not end there. Perhaps more famously than these two, Kevin Smith's films also include a pair of drug dealers/lay abouts/malcontents called Jay and Silent Bob. They appear in pretty much every film in what shall be offhandedly referred to as the "View Askewniverse", and have seemingly become large pop-culture icons in their own rights, with some of my acquaintances having only known them as "those guys from Dogma", or more hilariously in my opinion, "the guys from "Because I got high by Afroman".